Formerly Umbraulva olivascens (P.J.L. Dangeard) G. Furnari, nom. inval. Description: Thallus sheet-like, olive green, rather stiff and plastic-macintosh-like, to 400 long, often with regular, elliptical holes. Persists throughout the year. Habitat: on rock in sheltered, but full-salinity areas, often near shellfish farms. Also occurring on marinas in ful salinity. Distribution: Uncommon but widely distributed in W and S Ireland, Wales, SW England, Netherlands, N France (type locality is Roscoff where it first appeared in a tank in the Station Biologique in the 1930s), south to the Canary Islands; W and E Mediterranean. Some authors (e.g. Brodie, Maggs & John 2004: 106) suggest that this entity may be an introduced species from the W Pacific, which is the only other known location for Umbraulva species, viz, U. amamiensis and U. japonica, and U. dangeardii may be synonymous with one of these. Key characteristics: olive green colour and rather plasticy feel. 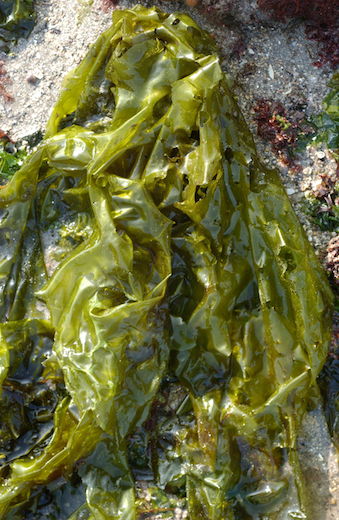 Species of Ulva, which it resembles, are more emerald-green in colour. Photograph: New Quay, Co. Clare, Ireland. Site © M.D. Guiry 2000 - 2019. Important copyright notice: all text, design and photographs on this site are copyrighted by M.D. Guiry unless otherwise stated and all rights are strictly reserved. Click here for copyright information and contact. Website design: 249 Design Studio. Site maintained by M.D. Guiry (michael.guiry@nuigalway.ie). There have been 8736831 page loads since 1 January 2014 on 25 April 2019.